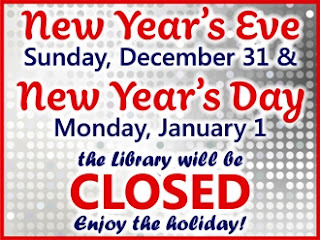 Just a reminder that the Library will be closed Sunday and Monday, December 31st and January 1st, for New Year's Eve and New Year's Day. We will re-open on Tuesday, January 2nd at 9:30 am. Although the physical building is closed, the Library is always open on the web at http://www.roselle.lib.il.us to download music, movies and books.